Like every piece of a hive, it can be built to suit you, however you like it! I often use boards I have scrounged from old barns, houses and job sites to make boxes from. Sometimes those boards are 1 inch thick. In that situation, the standard telescoping cover will NOT fit. So I build my covers wider and longer. 19 by 23 normally. Like the inner covers, I started out building them Like the commercial ones I originally bought. Routing a board for a 1/4 inch piece of panel or plywood to fit into with 45 degree corners.. It didn't take much time for me to change that practice. Like the inner cover and bottom board, I use 1/2 plywood for the top. This allows me to buy 1 sheet of plywood that I can cut 10 pieces out of. I don't have to buy three different types or thicknesses. I also started out buying rolls of flashing at about seventy dollars a roll. When you figure you can make 26 or 27 covers out of that roll, the seventy dollars drops to less than three dollars a cover, BUT, you need to USE that many covers to make it worthwhile. I stopped using the flashing, figuring I could always add it on later if I decided I needed it. 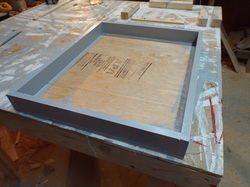 I use 3/4 by 2 boards for the sides, and half inch ply for the top. I have tops without flashing on them, that are three years old and still functioning fine. I paint the tops with one coat of primer, and two coats of decent exterior grade paint. Unless I run out of primer, then I use three coats of the exterior paint. Both ways seem to be holding well. I have tops with 3/4 inch boards, 3/4 inch plywood. 1/2 inch, and even 3/8 plywood. Whatever I can get for free gets used. If I have to buy it I buy 1/2 inch plywood and use it for tops, inner covers and bottom boards. Buying all the wood its still less than four dollars per cover to build. At that price, I can't afford to get fancy, its too easy to replace them. Twenty one dollars for a 4x8 sheet of 1/2 inch ply makes 10 pieces. thats $2.10 each. Plus the 2 inch side boards and paint.